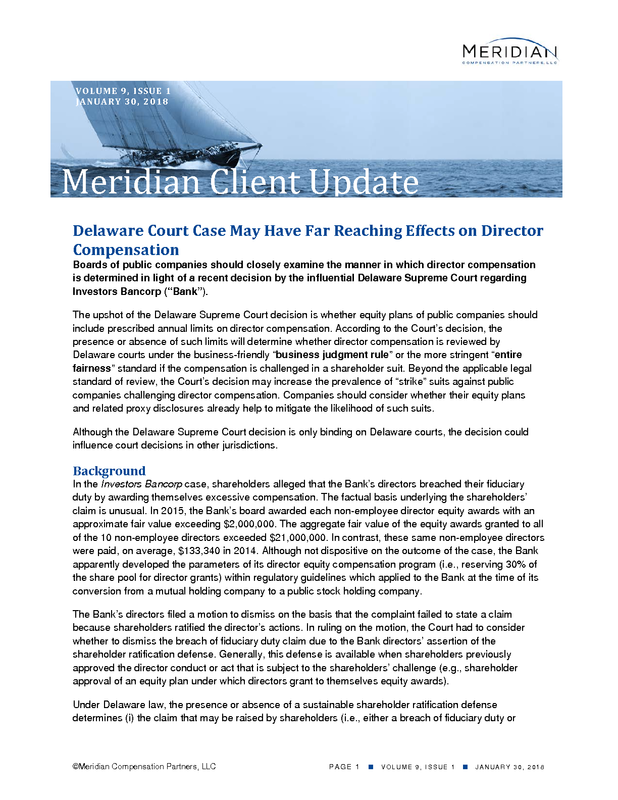 Boards of public companies should closely examine the manner in which director compensation is determined in light of a recent decision by the influential Delaware Supreme Court regarding Investors Bancorp (“Bank”). The upshot of the Delaware Supreme Court decision is whether equity plans of public companies should include prescribed annual limits on director compensation. According to the Court’s decision, the presence or absence of such limits will determine whether director compensation is reviewed by Delaware courts under the business-friendly “business judgment rule” or the more stringent “entire fairness” standard if the compensation is challenged in a shareholder suit. Beyond the applicable legal standard of review, the Court’s decision may increase the prevalence of “strike” suits against public companies challenging director compensation. Companies should consider whether their equity plans and related proxy disclosures already help to mitigate the likelihood of such suits. Although the Delaware Supreme Court decision is only binding on Delaware courts, the decision could influence court decisions in other jurisdictions. In the Investors Bancorp case, shareholders alleged that the Bank’s directors breached their fiduciary duty by awarding themselves excessive compensation. The factual basis underlying the shareholders’ claim is unusual. In 2015, the Bank’s board awarded each non-employee director equity awards with an approximate fair value exceeding $2,000,000. The aggregate fair value of the equity awards granted to all of the 10 non-employee directors exceeded $21,000,000. In contrast, these same non-employee directors were paid, on average, $133,340 in 2014. Although not dispositive on the outcome of the case, the Bank apparently developed the parameters of its director equity compensation program (i.e., reserving 30% of the share pool for director grants) within regulatory guidelines which applied to the Bank at the time of its conversion from a mutual holding company to a public stock holding company. The Bank’s directors filed a motion to dismiss on the basis that the complaint failed to state a claim because shareholders ratified the director’s actions. In ruling on the motion, the Court had to consider whether to dismiss the breach of fiduciary duty claim due to the Bank directors’ assertion of the shareholder ratification defense. Generally, this defense is available when shareholders previously approved the director conduct or act that is subject to the shareholders’ challenge (e.g., shareholder approval of an equity plan under which directors grant to themselves equity awards). ■ If the Court sustains the Bank directors’ shareholder ratification defense, then the burden would fall to shareholders to prove that the directors setting of their own compensation is not protected by the “business judgment rule” standard under which courts give broad deference to director decisions in the absence of evidence of corporate waste. ■ If the Court rejects the Bank directors’ shareholder ratification defense, then the burden shifts to the directors to show that setting their own compensation met the “entire fairness” standard of judicial review. This would likely require the Bank to demonstrate that the process for setting the compensation was appropriate and in good faith and that the amount of compensation fell within competitive market practice through a fact intensive discovery process at the next stage of litigation. On December 13, 2017, the Delaware Supreme Court denied the directors’ motion to dismiss and rejected the shareholder ratification defense because the directors retained broad discretion to set their own compensation under the equity plan, which included no specific annual limits on director compensation. Given this broad discretion, the Court reasoned that shareholder approval of the Bank’s equity plan was limited to the ability of the directors to make self-grants but not to the amount or type of self-grants. Therefore, shareholders had not ratified the challenged director compensation. The Delaware Supreme Court sent the case back to Chancery Court for further deliberations. 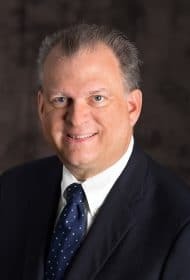 Does the Delaware Supreme Court decision mean that most U.S. public companies (at least those incorporated or doing business in Delaware) should eliminate director discretion in setting their own compensation? More precisely, does the Investors Bancorp case require a shareholder-approved equity plan to mandate that annual director compensation must be based on a fixed amount or formula (e.g., director annual compensation shall be equal or equivalent to $250,000) for the shareholder ratification defense to be available to directors? Alternatively, does the Investors Bancorp decision allow for the ratification defense when directors exercise their discretion in setting their own compensation within meaningful limits included in the equity plan (the Delaware Chancery Court in Seinfeld vs. Slager ruled that the shareholder ratification defense would be available under those circumstances)? Unfortunately, the Investors Bancorp decision does not provide clear answers to those questions. Further case law will be required to see how Delaware courts apply the Investors Bancorp decision under various facts and circumstances. What is clear is that when directors make decisions on their own compensation under broad or generic parameters under an equity plan, the shareholder ratification defense will not be available to the directors. In response to the Investors Bancorp case, companies and their directors should consider a variety of factors including governance considerations, litigation risk and design flexibility. The following chart is intended to aid companies and corporate boards in weighing these and other factors under a variety of scenarios. The risk of a strike suit should be further mitigated under each scenario through robust proxy disclosures on the process of setting of director compensation, including competitive benchmarking against peers (currently, the proxy rules do not require such disclosures).